If you are charged with a Michigan misdemeanor offense in Waterford your case will be heard at the 51st District Court, which is located at 5100 Civic Center Drive Waterford, MI 48329. If you are charged with a Michigan felony offense in Waterford, your case will begin at the 51st District Court for preliminary examination then proceed to the Oakland County Circuit Court for trial. Richard D. Kuhn, Jr and Todd Fox. The prosecuting attorney in Oakland County is Jessica Cooper who is the elected official in charge of the Oakland County Prosecutor's Office. Before you speak to a Waterford Criminal Defense Lawyer about your criminal charges, take some time to educate yourself with my free materials and videos. As a first time offender, you're feeling both confused and extremely nervous. You need an attorney who will act as both an educator and advocate, and will provide that extra calming influence on both you and your family. If you are charged in Waterford with a drunk driving, misdemeanor or felony offense, you have to make some big, potentially life changing, decisions in a hurry. There is an easy way to cut through all the hype you are bombarded with on TV, the internet, your mailbox and the Yellow Pages. 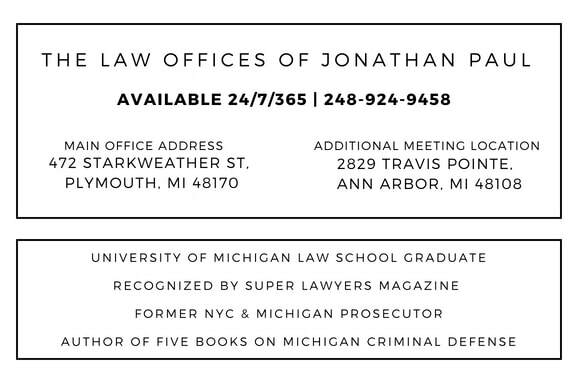 Former Prosecutor and top rated Michigan Defense Lawyer Jonathan Paul has written multiple consumer guides featured on this page to arm you with the truth and to provide you with the valuable FREE information you need prior to speaking to any lawyer about your case.